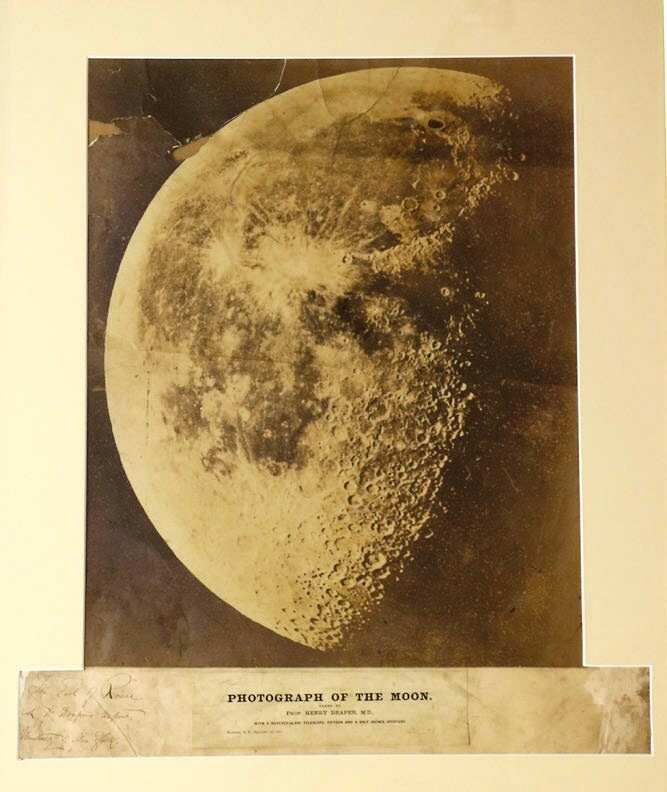 This image labelled 'Photograph of the Moon, taken by Prof Henry Draper, MD, with a silvered glass Telescope, Fifteen and a Half Inches Aperture, Hastings NY September 3rd 1863' sold for €5600 (£5000) in a Fonsie Mealy auction. The image has some tears and shows a centre crease where it had been folded but it took €5600 (£5000) in a Fonsie Mealy (plus 20% buyer’s premium) house sale on March 5 in Castelcomer, Co Kilkenny, Ireland. Much of the sale comprised the contents of an 1820s period residence with one of the most recognised addresses in Ireland: the Oxmantown Mall development in Birr, Co Offaly. It has a close connection to Birr. Having completed his medical thesis in 1857, Henry Draper (1837- 1882), a future professor of medicine at New York University, spent a year abroad. His travels brought him to Birr Castle, where the 3rd Earl of Rosse had erected ‘the Leviathan reflector’, then the world’s largest telescope. It was this that inspired him to build his own observatory on his father’s estate at Hastings-on-Hudson – a debt noted in the handwritten inscription to the mount The Earl of Rosse, with Dr Draper’s Respects, University of New York. It was previously in the collection of Otto Boediker, who was the astronomer in charge at Birr Castle from c.1887-1916. Draper inherited his interests, skills and energy from his father, John William Draper (1811-82), the Lancashire-born professor of chemistry at NYU, who improved on Daguerre’s process to produce some of the earliest photographs of the human face and the first photograph of the Moon in March 1840.